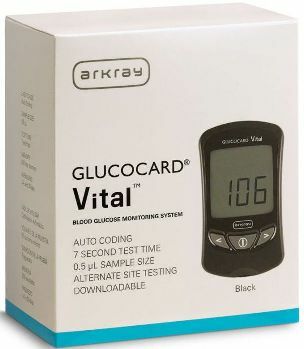 Click the button below to add the Arkray Glucocard Vital 600 Test Strips For GLucose Care to your wish list. Arkray GlucoCard Vital Blood Glucose Test Strips are easy to handle, highly accurate and especially meant for in vitro diagnostic use. These test strips require small 0.5-µL (microliter) blood sample that makes testing more comfortable and results in seven seconds. Strips are good for up to three months after opening. Great Price, Great Product! Identical product to those sold elsewhere at much higher price! We believe in fast shipping and excellent customer service. We strive to ship you " " within 1 business day or following day business day. All claims of product accuracy and Guaranties are made by its respectable manufacturer. Please contact Manufacturer and Maker of Brand and product for complete detail about this individual product. Picture and Graphic images of at this and any other product page are only for demonstration of look of the item. Item may differ in its look and may have Extra Writing like Mail order, DME or Not for retail use. All Glucose Testing Supplies on our site and In our Store and NON Retail packs. © 2019 Medical Supply Corner, All rights reserved. Content and information on Medicalsupplycorner.com is provided for informational purposes only. It is not meant to substitute the advice provided by one's physician or any other medical professional. You should not use the information contained herein for diagnosing or treating a health problem. Please Contact your Local Consultant or Specialist for Detail information about product (S) While we work extremely hard to ensure that all product information is correct, manufacturers sometimes change their logos, packaging and products. You should use our site as a reference, carefully read all product packaging, and contact the manufacturer with any questions before using a product. We are not liable for inaccuracies or misstatements about products. Customer reviews are provided for informational purposes only. Customer reviews reflect the individual reviewer's results and experiences only and are not verified or endorsed by Medicalsupplycorner.com. Actual results may vary among users. All Diabetes And Glucose Splies sold by medical supply corner are mail order, DME , Medicare packs.